Links : Stereogram Images, Games, Video and Software. All Free! 13. Philippe Coudray http://www.philippe-coudray.com/Pages/1-Sous-pages/Autostereogrammes.html Amazing artistic stereogram drawing, no computer software was used, except for retouching. 1. 3D Single Image Stereograms (yahoo) http://groups.yahoo.com/group/3D-Stereograms Active 400+ members group at yahoo groups. 9. Sirdslets http://benibela.de/games_en.html#sirdslets A side-scrolling game in which you move a space ship while you have to avoid several obstacles like mines or black holes. 3. 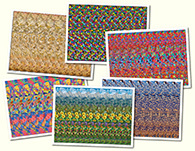 Magic Eye http://magiceye.com Producers of the Magic Eye� images that ignited the world-wide 3D craze of the 90's. 1. this is really cool and i can do it!!!!!!!! !i love cats!!! meow!!!! 14. Great page. 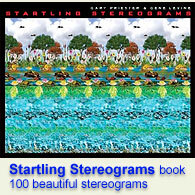 Useful links to work by the most talented autostereogram artists.